It has been such a pleasure over the last year to continue to meet and engage with IGCS members all over the globe. I recently had the honor of traveling to Central Asia to learn more about this beautiful region, the incidence of gynecologic oncology and the opportunity to get to know the wonderful people who live there and their strong affinity to IGCS. Under the leadership of Dilyara Kaidarova MD, PhD, Director of the Kazakh Institute of Oncology and Radiology, Almaty, Kazakhstan a meeting was held with representatives from Russia, Georgia, Uzbekistan, Tadzhikistan, Ukraine, Kyrgyzstan, and Center for Global Health, National Cancer Institute. At the meeting each of the centers within the region provided an overview of the population. They presented the burden of disease along with their top challenges, barriers to provide optimum care, and ways they feel collaborations with IGCS would be beneficial. I am pleased to say at the conclusion of the meeting the Association of Oncologists of the Republic of Kazakhstan signed our Strategic Alliance Partnership agreement. Kazakhstan is a country that while very progressive in the care and treatment of gynecologic cancers is not without its challenges. However, I am confident through our partnership we will together continue to improve the lives of women afflicted with gynecologic cancers. 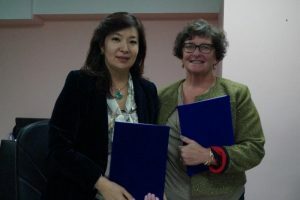 In the true spirit of collaboration Dr. Kaidarova said, “we are very excited about our partnership and the commitment of IGCS to advance the care we provide in Kazakhstan and beyond our region. It would be my goal to include others in the region who align with our goals and mission.” Central Asia consists of Kazakhstan (pop. 18 million), Kyrgyzstan (6 million), Tajikistan (9 million), Turkmenistan (6 million), and Uzbekistan (31 million), giving the region a total population of about 70 million. 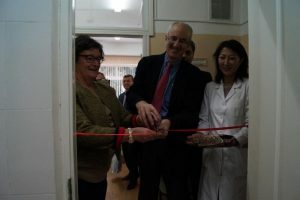 It was with great pleasure while in Almaty, along with Edward Trimble MD, MPH, Director, Center for Global Health, National Cancer Institute, to participate in a ribbon cutting ceremony for the opening of a vaccination clinic at the women’s health center. After many setbacks and challenges, it was heartwarming to see the clinic open and to see firsthand the team and leaders of the Kazakh Research Institute of Oncology and Radiology’s commitment to primary prevention of cervical cancer. Please click on this LINK to see more photos of regional meeting, conference, and other events in Kazakhstan. 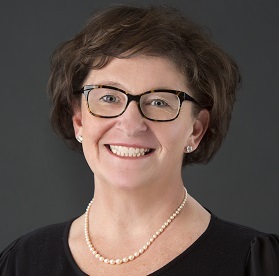 IGCS continues to benefit from a very solid international base of members who represent the diversity of clinicians caring for women with gynecologic cancers. The opportunity to expand our membership to regions throughout the world will continue to allow IGCS to bring our shared resources, vision, mission, and incorporate our member driven values globally. It is my hope that we continue to make a difference in gynecologic oncology.